I just finished an epic battle with PowerPoint cause by a recent round of Windows Update. My colleague ran into the same problem so it’s time to share the cause and very easy fix to this problem. If you see “Some controls on this presentation can’t be activated. They might not be registered on this computer” when you startup specific PowerPoint files and you’ve recently updated your computer then this is likely your problem. Then try to place one of the “Controls” onto your blank new PowerPoint file. From there just search for “*.EXD” and remove any files that you find. These files are temporary and will conflict with the new files that were installed by Microsoft. Instead of uninstalling updates and Office multiple times, take the easy way out and delete these files. Restart PowerPoint and you’ve got your fix! Before you connect to a PostgreSQL database, the PostgreSQL .Net Data Provider needs to be installed. To install the PostgreSQL .Net Data Provider, see Install the PostgreSQL .Net Data Provider. Server will be localhost and the tunnel port that you setup before. If you’re following along closely we setup localhost and used the default value of 5432. This plugin doesn’t appreciate non-default port numbers so be sure to use the default. You will need to enter your database username and password also. You will likely get the following popup which is a good sign and you should accept. If you run into trouble leave a comment and I’ll see if I can help. This is a solution I managed to cobble together through trial and error and a lot of web searching. 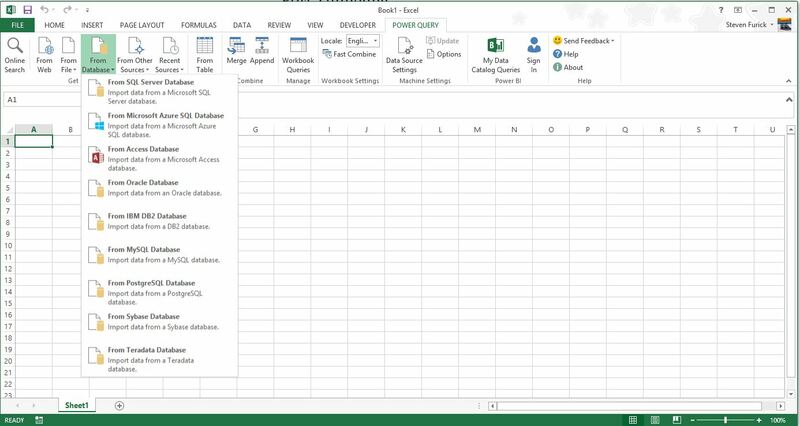 The fundamentals will be applicable to any remote database and should save you a lot of time searching. 1) Setup the tunnel with Putty. It’s good to test this connection before going forward. Once you have confirmed your connection to be functional you will need to reopen putty and setup your sever connection again. This time give it a name in “Saved Sessions” and click “Save” to store the configuration. Go back to Session and be sure to Save your configurations otherwise they will be lost next time you start putty. Like I said, Putty really likes to delete configurations. You’ll get this screen to login and once complete your tunnel will be setup! I’ve been using my 4K monitor for a few months now and it’s changed the way I work and interact with the computer. It isn’t without some challenges. 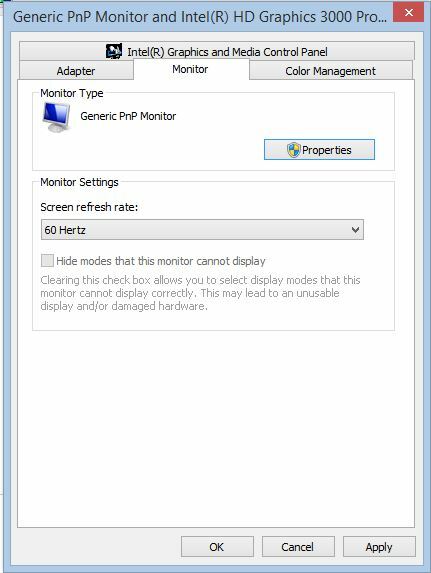 If you are accustomed to a 60hz monitor (a monitor which can refresh the screen 60 times per second) and you switch back to 30hz you’re going to feel like there’s some lag in the mouse. The technology is moving in the direction of higher frame rates as HDMI standards start to catch up with the screens but for the average user, those advances are expensive and difficult to work with. Most shows and movies are presented in 30hz so you wont notice any difference when watching movies and the 4K makes for a really stunning picture quality. 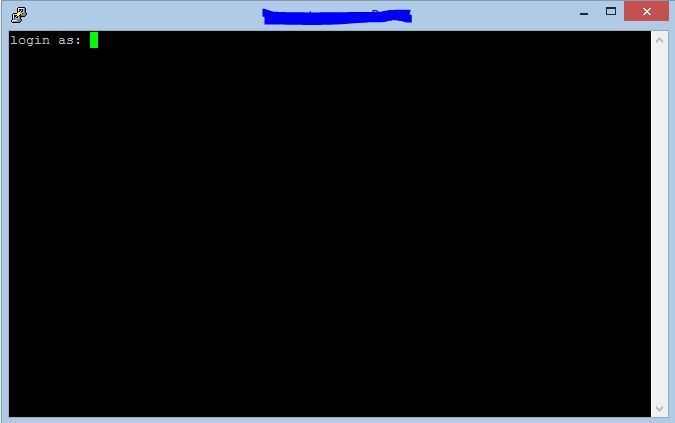 Right click on a blank area of the desktop and select Screen Resolution. You’ll need to change Resolution down to 1920 x 1080 in order to access the higher refresh rates. Windows knows enough to limit your selections in the next step. Select the 60 Hertz from the drop down and hit apply. All your changes will go into effect. To change back to 4K just do step 1 and 2 but select the 4K resolution. The hertz will automatically set to 30 hertz. I’ve been playing around with this for a few days now and the internet has either really outdated or really unhelpful information. Now that I’ve got it working in all it’s tiny 4K pixel glory, I figured I would give back. I did this on Windows 8.1 Professional using a Intel Core2 Quad Q8200 and 2 HD5770 graphics cards in cross fire. These are admittedly old hardware components but if you are using something different I can’t guarantee your results. With that being said, the results for me have been amazing. The process is relatively simple thanks to ToastyX and his utilities. In the interest of giving credit here’s a link to the post that really made this all possible for me. If you don’t want to wade through all that the steps are below. Download and install the latest CCC drivers from ATI’s website. 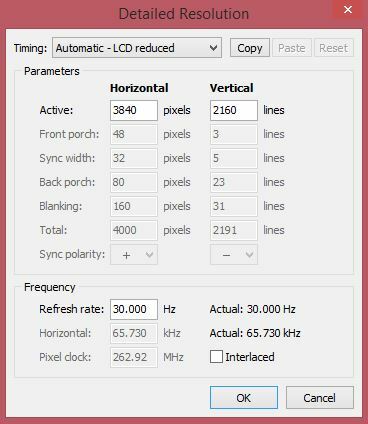 Download AMD/ATI Pixel Clock Patcher – For whatever reason ATI seemed to be refusing to let me use the dual channel capabilities of the cable that came with the Seiki tv. Apply this patch to get at all that bandwidth. Download CRU-1.1 – This amazing application lets you override the available options from the display settings menu. 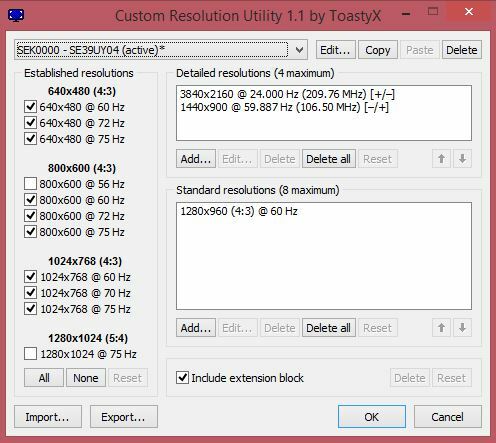 Click add and set your resolutions to 3840 by 2160 by 30hz and choose LCD Reduced to save some bandwidth. 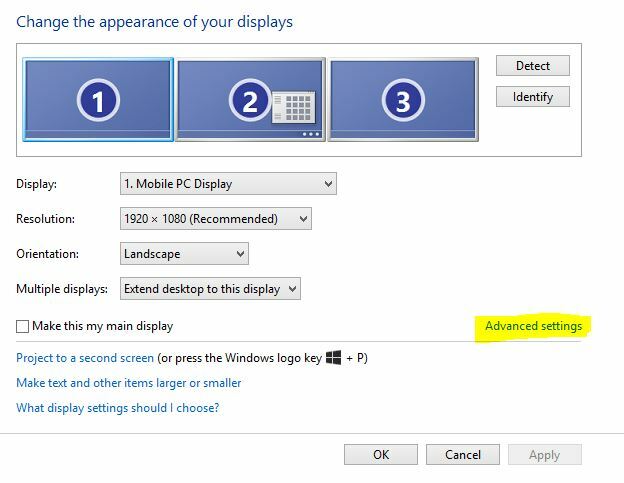 I was unable to get it to work without this option unless I reduced the refresh rate. Hit OK and restart your computer. That’s all there is to it. Enjoy all your extra resolution without any additional hardware. Recently my alt-tab functionality in Windows 8 reverted to a much more boring version. Instead of displaying super hand pictures of the target windows it showed just their icons. This makes it very tough to identify which explorer window I’m headed towards. Even if you like editing the registry, I recommend this awesome free tool. 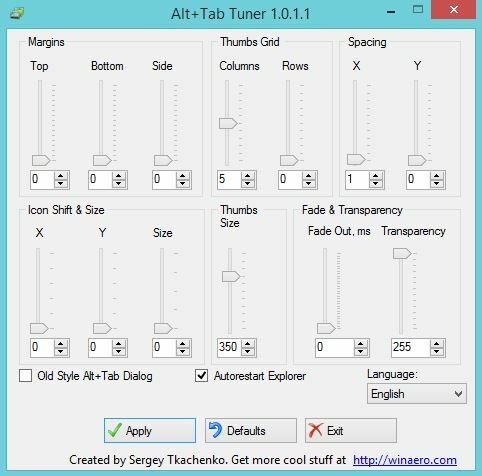 It’s called Alt+Tab Tuner by winaero.com. You can download it here. It gives you the power to change settings you didn’t even know you were missing. Increase the size of the previews, decide how many previews show up on each column or row, change transparency values. This is functionality that should have been included with Windows. It’s super tiny and doesn’t require an install. Just download and run. One point of clarity, 0 means default so if you want minimum spacing set it to 1 like in the picture above.